Light Punching Mitts, highly efficient shock absorption from EVA-LUTION FOAM and Supremo-Shock Foam. Hand-Shaped Mould. Constructed to fit the natural curvature of the hand. Secure closure with EZ-Grip Technology Focus Punch Pad. Light weight foam provides superior shock absorbency while limiting trainer fatigue. Durable Maya Hide construction with inner Maya Hide hand compartment enhances durability of boxing pads. Performance Engineered Leather Construction Focus Mitts. High quality and durable material is easier to clean and maintain. Strategically placed perforations on upper layer for air ventilation provides breathability and keeps trainer hands comfy. Half Ball Palm Grip. Allows for a comfortable and secure grip helps prevent injury to the coach pad user. 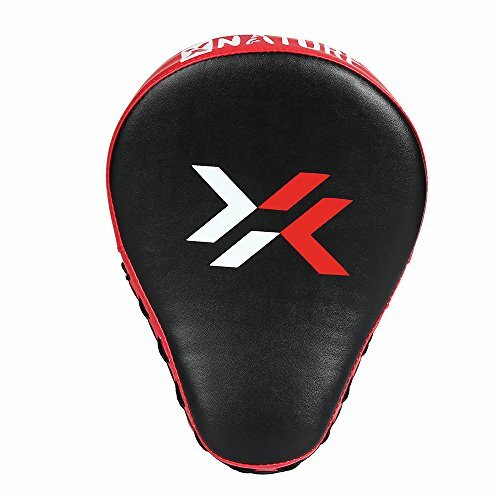 Curved boxing pads were designed with trainer\'s in mind. Mesh Backing with Adjustable Wrist Strap. Helps keep hands cooler and increases breathability of the mitts.